Why is this called Theater Mode? 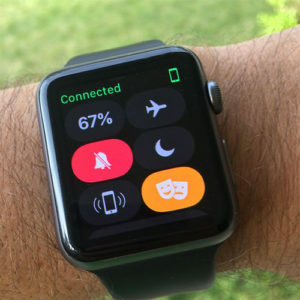 If only 10% of Apple Watch users sleep with their watches on (as I do), this will be used for sleeping a hundred times as often as it’s used at the theater. To me though the biggest question is, if control center is going to scroll, what about all the other things that could/should be in there? For starters, how about a brightness slider? I have my watch permanently set to the dimmest setting because of how bright it is indoors after dark and because of how buried in settings the brightness adjustment is. Until the watch gets a much-needed hardware light level sensor, wouldn’t a brightness setting be a natural thing to have in control center? (And seriously, control center should be user-configurable. I never ever use the mute (always on), Do Not Disturb (on a timer, synced with my phone), or airplane mode (also better activated from the phone) buttons, but I would use volume and brightness sliders every single day. Sixteen hours after charging the device, it still had 75 percent battery, even “with everything turned on like location services and background app refresh. I updated yesterday, didn’t charge overnight, and am currently at 21%.